This is one of my favorite stories about teachers and learning to read. It’s actually a true story about the author, Patricia Polacco. As a young girl, Tricia didn’t learn to read like the other kids in her class. Whenever she tried, the letters and words would wiggle and squiggle on the page. School got harder and harder for her. Reading and Math became torture. When her family moved across the country, Tricia hoped that she would do better in school and that nobody would notice that she couldn’t read. By the time she was in third grade, Tricia was teased and bullied by the other students. This made her hate school. But in fifth grade she met a teacher who changed her life. Mr. Falker appreciated Tricia’s talents for drawing. He was able to stop the students from teasing her in the classroom, but he couldn’t do anything to help her when she wasn’t in his classroom. Mr. Falker understood Tricia. He worked with her after school and taught her to read in a way that she could understand. Finally, she read! And she understood the whole thing! When she got home she grabbed a jar of honey and spooned honey on its cover just as her grandfather had taught her when she was a little girl. Because of Mr. Falker, Patricia Polacco learned to love school. Years later she was met Mr. Falker again and thanked him in person for the gift of reading. The same gift she uses now to write books for children. This book is a tribute to him and to teachers everywhere who help children learn to read. Below is a wonderful reading of the story, Thank You Mr. Falker, by actress Jane Kaczmarek. It is part of the Screen Actors Guild Foundation Book Pals. Even if you have read the book, you owe yourself the favor of listening to it read and savoring the richness and the sweetness of the language and the story. If you have never read it, you must watch. I guarantee it is a treat for the eyes and ears. Decorating eggs is a very old tradition dating back thousands of years, even before the time of Christ. Early Christians adopted the custom of decorating eggs at Eastertime to represent the resurrection and the new life within the egg. The tradition of decorating and giving eggs to others at Easter continues today. 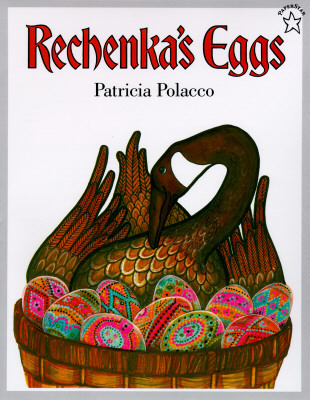 Today, I would like to share with you one of my favorite story picture books, Rechenka’s Eggs written by one of my all time favorite storytellers, Patricia Polacco. Rechenka’s Eggs is the story of an old woman, Babushka, who paints the best Easter Eggs in her village. Every year, Babushka takes her eggs to Moscow for the Easter Festival and every year she wins first prize. One day, Babushka sees a goose shot from the sky by a hunter. She rushes to save the goose. She brings it home and names it Rechenka. Rechenka sleeps in a basket filled with Babushka’s warmest quilt until she is well again. To repay Babushka’s kindness, Rechenka lays an egg for breakfast every morning. But one day, Rechenka flies up on Babushka’s worktable and knocks down the basket of painted eggs breaking them into a million pieces. The next morning, when Babushka goes to the basket to collect her egg for breakfast, she finds the ‘most brilliantly colored egg she had ever seen’. When it comes time to go to Moscow, Babushka leaves Rechenka to return to the wild and takes Rechenka’s eggs to the Easter Festival where everyone is amazed at the wonderful eggs she has brought. Babushka wins first prize and a feather quilt to take home. She goes to bed alone that night under her new quilt, and in the morning Babushka finds that Rechenka had left her one last gift, a glorious egg in her basket, one that is different from all the others. From the egg a gosling hatches. And this baby goose remained with Babushka always. Those of you who know me well, know how much I admire Patricia Polacco’s storytelling style. It’s not your typical picture book prose, with few sentences and basic vocabulary. (This one comes in at over 2000 words!) It’s rich. It’s deep. It’s emotional. And I love it! 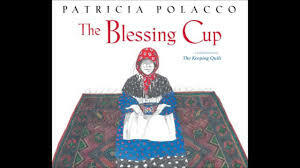 Her newest picture book, The Blessing Cup is a companion book (actually a prequel) to The Keeping Quilt. It is a beautifully written story of her family’s exodus from Russia with nothing except what they could carry in a small cart pulled only by her parents. In addition to papa’s sewing machine, their menorah, and his holy books, their most prized possession was the china tea set given to her great-great-grandmother on her wedding day. The tea set is ultimately given to a kind doctor as a gift for nursing papa back to health after he collapsed in the street. The doctor took the whole family into his home while papa recovered and sold a Persian rug to buy them passage on a ship to America, after he was found housing Jews. Mama only kept one cup which she shared with her family every night. Eventually this one cup made its way to each generation of daughters. Each daughter learned the story of the exodus and the kind doctor. Each daughter was given the blessing cup as a wedding gift. Each daughter shared in its blessings. To quote from the front flap, “The Blessing Cup is a story of family, tradition, and , most of all, love.” It’s a wonderful story and I hope you take a few minutes to share it with your family. And for those of you who are preparing to celebrate Hanukkah this week, peace and blessings to you and your families! I just found this interview with Patricia Polacco on NPR and would like to share it with you. Please take a listen, she gives such insight to herself and her work.